[whitequark] has been experimenting with a blowtorch for SMD reflow. Having just moved 8,000 km [whitequark] was stuck without any of the usual reflow tools. They did however have a blowtorch handy, and gave it a go. When [whitequark] mentioned attempts on Twitter, we figured the results would mostly involve charred PCBs, smoke-filled rooms, and a possible trip to the local hospital. But [whitequark] is more sensible than we are, and by carefully monitoring the temperature and gauging the distance was able to get pretty decent results. [whitequark]’s made a couple of further attempts and has had varying results. Overall, I’m not sure it’s a technique that I’m interested in trying myself, but it goes to show that in a pinch, a hacker will always find a creative way to get the job done. ” if you have the attention span of a hamster on meth” – LOL! say what you want about meth. it helped us kick hitlers buttocks back in the ’40s. tin binnies they used to call em. But … how many hamsters did you smoke? above links are for those who cant connect due to browser not being able to the new https. There’re a lot of people soldering smd with heatguns. I don’t see much difference in using a blowtorch, exept for the water vapor. It’s an awesome trick for emergencies and/or try SMD without investing a lot. That MAP gas is discontinued here. We now have a *MAP PRO Replacement* gas. So the blue bottle is propane. The old yellow bottle was MAP gas and the new yellow bottle is also Propane. The significance is that the old MAP gas was about twice the temperature of propane, it was even hot enough to braze with 15-25% silver brazing rod. But for the purposes presented here both gasses are hot enough for the job. Even benzine or butane would do. Just have lots of outdoor ventilation. This combustion creates carbon monoxide which is odorless and lethal in high doses. FYI the gas I used is MAP Pro not actual MAPP; I haven’t really ever seen any actual MAPP sold. The only company that produced MAPP stopped many years ago. The new MAP/Pro is really quite overpriced (dare I say “a scam”); 3730F compared to 3600F for propane — and those are Bernzomatic’s numbers. I hate to see people using it or encouraging its use because it has such a dubious benefit. Ah ha! That explains it. I hadn’t used any for years, and then bought a bottle last year. I thought there was something wrong with my torch. I just tried this with an old circuit board and the same gas. Regulating 2000 C down to 200 C by distance is not for me lol. It was a total failure. I will go buy a heat gun if I need to and save the gas for brazing. So I tip my hat to you for your success. I tried a propane torch for desoldering boards (as in “strip parts to reuse elsewhere”) and I found it too hot. The boards would burn awful fast. But, I once had some 256K SIMMs and a junk motherboard with 1Meg RAM, so I used my Black & Decker heat gun to get the RAM off the motherboard and the RAM off the SIMMs, and solder the larger RAM onto the SIMMs. Worked fine, except the RAM was the wrong kind, couldn’t be refreshed by my Mac Plus. Everything was fie if I actively used it, but would crash if I left it for a while, then moved the mouse. I then discovered it was a known problem. A few months later when I did buy 1Meg SIMMs for that Mac, one wasn’t properly soldered, and I used the heat gun to reflow the solder. The heat gun is useful for stripping parts, in a pinch I might use it to remove a part that needed replacing. I trust it more, but then I’ve used it more around circuit boards than the torch. I have a number of flamie toys. I think using propane or LNG would be easier than using MAP gas for removing parts by heating the opposite side of the PCB (if you don’t want the PCB) but it would be a bit of an art at first like learning to solder. Getting the distance right would be a challenge. It’s a bit like a suggestion I heard here on HAD before … if a toaster has 10 setting from (1) to (10) they would be (1): warm, (2 – 10): 9 densities of smoke. Heat gun is pretty useful, but you have to burn a board or two for learning. Once you get it desoldering PCI, ISA, memory and processor slots works like a charm. Blowtorch can be used, but it’s very hard to control, much harder than heat gun. Actually, I got on okay with one of those mini butane torches doing that. Blacked up the boards a little with carbon, but didn’t burn or warp them. Components survived well. Got annoying refilling it every 20 mins though. The output from a heat gun is a little broad [too wide an area], but if you make a cone from a tin can to focus the air stream a bit, and put it on the heat gun’s nozzle…. I repair arcade logic boards and often see the handiwork of people who need three tries to figure out which end of the soldering iron to hold. 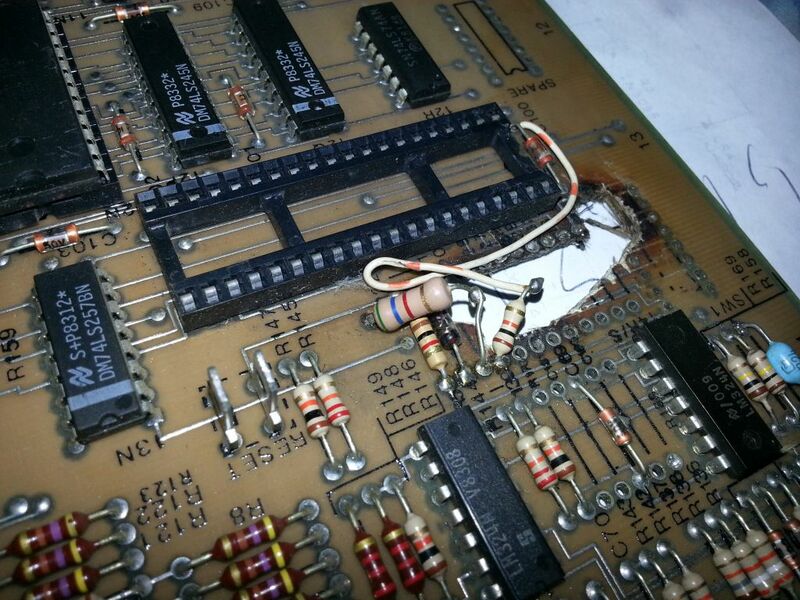 This pic is of an Atari Major Havoc that a tech burned through while using a blowtorch for rework. FYI Working MH boards can go for close to $1000. This was not a cheap mistake. The link is broken (empty file). Would have been good to see the pic but in any case don’t thning that person can claim to be a ‘tech’. Nice hole in the board! I’ve succesfully used a blowtorch to reflow a BGA chip of the integrated videocard of a laptop. Might I add I was doing this at 2 AM in front of our hackerspace whilst a neighbour in his pyjamas across the street was looking horrified out of his window. Buahahahahaha! Even with the finest tools, a reflow usually won’t last more then 1-3 month. Sorry to disappoint.